Fun song writing experience with singer/song writer Shay Bailiff coming to Bossier City! 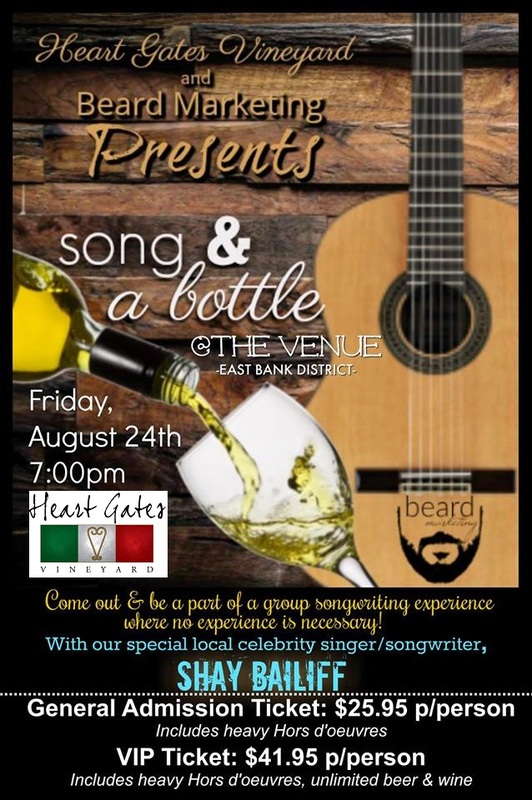 Heart Gates Vineyard & Beard Marketing are introducing Song and a Bottle. An entertaining opportunity for you to interact with family & friends while creating a new hit song with Shay Bailiff! Endless possibilities of the song that will be written with the crowd’s input. Come embrace your creativity within! Fun evening with food, beer & Heart Gates Vineyard wine. Love supporting local businesses? Funds raised from this event help support the development efforts of Shreveport’s Heart Gates Vineyard. Your attendance has more than one purpose, help us develop our farm & facilities while also helping yourself to an entertaining evening! 1. Do I need to know anything about music to participate? Know anything about music? Me either! That’s Shay’s job! We will all still have a good time during this interactive song writing experience. An MC will be asking the audience for topic suggestions with scripted questions. The answers to the questions will help the celebrity singer/song writer create the song during the evening. The crowd’s final song will be performed at the end of the evening for all to enjoy. Includes heavy Hors d’oeuvres & a fun evening out! Includes heavy Hors d’oeuvres, unlimited beer, Heart Gates Vineyard Wine & an entertaining experience with friends! 5. Where can I buy my tickets? 6. Who is the special celebrity singer/song writer for the evening? 7. How should I dress?